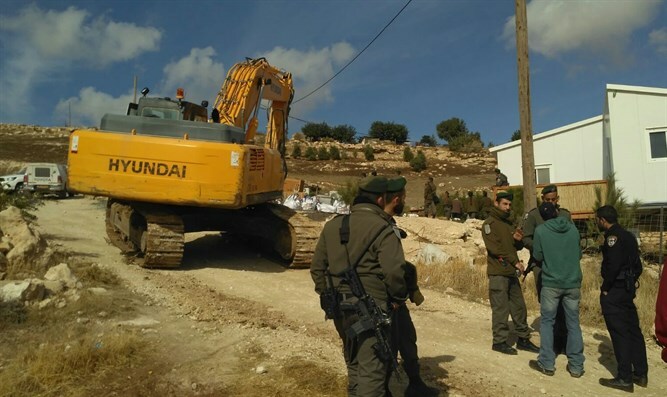 Police forces destroy Binyamin-region homes. Yoad, one of the residents, describes how the events unfolded. Dear friends, I did not think the State of Israel would trample me like this. Neveh Erez is an official settlement in the Binyamin Region, and was founded in 1999. I joined it half a year ago, received a plot of land, and began to build a wooden house. When I received orders to cease construction, I obeyed them and went to the Civil Administration accompanied by my lawyer. At the hearing, we were granted an extension, and I waited until we could meet the Regional Authority Head in our town. When we met him, we were told that there is tension with the Civil Administration, but that the Regional Council wants to ensure our town's continued existence. As long as we act properly, everything will be fine, and no one will do anything about the orders to cease construction. Feeling encouraged, I continued to build my home. I didn't receive any warnings, and neither did my lawyer. At 9am, dozens of Border Police arrived in two buses, and surrounded my home and one additional home. A Civil Administration supervisor who refused to identify himself as anything other than "Mikey" showed no official demolition orders, displaying only a photo on his cellphone's screen. He supervised the demolition, as my friends and I were forced out of our homes. Our belongings were quickly removed, and all off my lawyer's efforts to speak with one of the supervisors met with failure. When I asked for an extension in order to request the court cancel the demolition, explaining that I had received no warnings, my request was refused. A bulldozer destroyed my home and my neighbor's home, and a second bulldozer destroyed anything left, crushing it. They did not touch any of my town's other homes. They were luckier than I was. I stole no one's land, I took not a penny from the government, and I did not act violently. I was willing to evacuate my home, and take apart the house I had built myself - if they had given me some warning. I don't understand why I had to suffer from this random, violent, and inflexible incident. I'm sad that I lost the home I wanted to live in and build in this town, and I'm sad that this is the State's way of doing things. The Civil Administration responded, "We enforced the law by destroying three illegal buildings in the area of Neveh Erez. These buildings were built without the proper permits. Enforcement was carried out after we had already attempted previous enforcement orders and other statutory and legal processes."